The visit aimed at discussion of the further development and plan of activities within TRACECA. The Parties exchanged opinions in view of the new priorities of TRACECA regarding the transformation info international organization. Mr. Said informed Mr. Ciopraga that Tajikistan as one of the part of TRACECA corridor highly appreciates the initiative of such transformation. Mr. Ciopraga expressed his interest to get familiar with the ideas and proposals suggested by beneficiary and non-beneficiary countries concerning the ongoing projects within the framework of TRACECA program. In addition, the necessity of ensuring sustainable development and effective improvement on the corridor are of great importance. 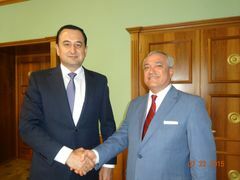 Mr. Said assured Mr. Ciopraga on the active cooperation of Tajikistan Party. It was mentioned that 8 international corridors pass through the territory of the Republic of Tajikistan. At present in Tajikistan 3 investment projects are implemented within the framework of the international transport corridor TRACECA and for the development of logistics it is scheduled to implement 7 more infrastructure transport projects in the future when financing is found. During the meeting Mr. Ciopraga expressed my deep regret to Mr. Said on the recent huge flood occurred and landslide in the east Tajikistan and early settlement of the results of destruction. On the outcomes of the meeting, it is agreed to continue detailed discussion on the most outstanding TRACECA issues during next meeting of Mr. Ciopraga to Tajikistan.